Approximately, one million Tanzanians between the age of 15-49 are HIV positive – a staggering statistic considering how preventable transmission of HIV and AIDS is. In a new initiative to encourage the correct and consistent use of condoms called Vaa (Put It On) Kondom, AED and the T-MARC Company through T-MARC Project are supporting Tanzanians in taking personal responsibility to help prevent new infections. Launched on May 22 in Tunduma, a town boarding Zambia and Malawi along a heavily trafficked roadway, Vaa Kondom reach those populations most at risk for HIV along transportation corridors and in workplaces such as mines and plantations. The launch event also marked the start of the complimentary SafeTStop program: a package of HIV and AIDS services and related community programs, as part of the Regional Outreach for Addressing AIDS through Development Strategies (ROADS) Project, a five-year, nine-country HIV program along major transport routes in East and Central Africa. SafeTStop supports targeted community mobilization, education and improved HIV and AIDS services including counseling, care and support, improved management of sexually-transmitted infections and begins to address the root causes of HIV and AIDS in the community -- i.e., alcohol abuse, gender-based violence, and economic vulnerability particularly of women and older orphans. With technical and financial support by the United States Government through the President’s Emergency Plan for AIDS Relief (PEPFAR) and the United States Agency for International Development (USAID), both programs provide useful tools and information to help people at risk of HIV to change their behaviors, to protect themselves and their families, and to know their HIV status. 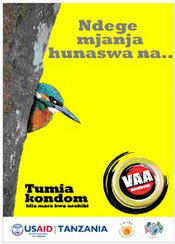 Vaa Kondom promotes the use of any condom (not a specific brand). 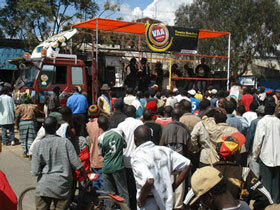 Outreach activities, peer education, and small venue entertainment (in bars, guesthouse, etc.) form the core activities of the initiative. Supportive radio spots have also been produced to compliment those peer-to-peer strategies. A variety of communications materials using Tanzanian traditional sayings are designed to provoke thought and discussion among the audience.